Tag Archives for " sprint overdrive hotspot "
I broke down and bought Apple’s iPad device. Hey, I’ve some willpower, I waited until it had been on sale for a couple days. I’ll share a few quick thoughts about the device, not so much for the cool factor, but because I know a number of small biz folks are considering the purchase. 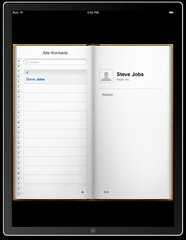 I’m sure people at Apple made this clear in the marketing of the iPad, but I didn’t get it. The iPad is a great device to consume content and do a few chores at the coffee shop, but it does not compute. There’s no internal file storage, it’s not a good device to write, edit or design on. The characterizations of being a big iPhone are pretty accurate, but the display and ability to read much larger blocks of text, make it worth the price for me. Sales people and anyone that makes presentations to small groups should jump all over this device. Add the Keynote app for the iPad and you’ve got the slickest demo machine on the planet. It’s lightweight, stunning and delivers stunning visuals. You can load your PowerPoint presentations to a folder in iTunes, sync, and open them in Keynote. For the moment I couldn’t figure out any way to pair the iPad with an iPhone to use an app like Keynote Remote as a remote control so the use of an iPad, even with the optional VGA adapter, is limited for using a projector, but look for this to happen soon. I also use dropbox for online file storage and dropbox iPad app allows you to view must files you can use it to store files you want to show to a prospect of customer. The biggest device that took a hit in my world is the Kindle. I was an early adopter of the Kindle and still like reading better on the non backlit screen, but I can’t afford to keep it around in the bag. Amazon’s iPhone/iPad app allows me to bring my entire Amazon library now and into the future on to the iPad. iBook library is pretty thin at the moment so now I still get to dig into Amazon’s entire set. This is a brilliant move and I’m wondering if Apple will throw up some roadblocks when they actually get iBook built up a bit more. General impression – I like it alot and think there’s more to come, it’s kind of middleware, but I worth the money. Get the 64G wifi version and add the Sprint Overdrive 3G/4G Hotspot so you can use the iPhone, iPad, and MacBook on the same network wherever you are. I don’t think there’s much reason to get the 3G version when you can do what I’ve described above and power up to 5 devices for the same money. You’re views and app suggestions greatly appreciated!